I have been on a Fredrick Backman kick this year, reading A Man Called Ove and Britt-Marie Was Here and Beartown more or less in succession. Have you read any of his books? They’re quirky and warm and poignant and thoughtful – and did I mention quirky? Not to mention occasionally laugh-out-loud funny and frequently delightful. This summer, I started reading another book by Bachman out loud to Tristan and Simon. My Grandmother Sends Her Regrets and Apologizes is a quirky and whimsical book that features a mythical beast called a wurse that has a love for a Swedish chocolate bar called Daim. So when I happened to be in IKEA the other day (seriously, when am I not in IKEA?) and saw bags of mini-Daim bars for sale, I picked one up to entertain the boys. Oh my goodness. Seriously? No wonder the wurse loves them. Best! Bar! Ever! They’re a little bit like Skor bars, but there’s something about the bite-size format that makes them so much better. I watched Simon’s eyes bug out in appreciation when he first tried one. They’re so addictive that I might have gone back and bought a second one-pound bag to hide in the back of the cupboard. And, erm, maybe a third for my office. Seriously, I don’t even like sweets that much. I’m a salty chips sort of girl! 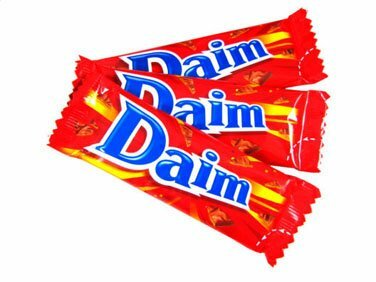 Have you tried Daim bars? If so, what do you think? (And if not, get yourself to IKEA, stat!) And if you haven’t read any of Fredrick Backman’s books, you’d better get on that, too. They’d be perfect to read with a cup of coffee and a big bag of Daim bars. I was intrigued by the premise of the book Mitzi Bytes. It’s about a blogger who started her blog way back in the primordial swamp of the blogosphere, a dozen or so years ago, and who kept writing as her family grew and evolved. (You can see why I was intrigued!) Unlike me, however, blogger Sarah Lundy chose to keep her blog identity anonymous, writing under the pseudonym of Mitzi Bytes. The novel explores what happens when Sarah’s carefully separated online and offline worlds collide. It’s especially painful because Sarah has been less than kind in her depictions of those closest to her. I have to admit, I was reluctant to like this book going in, maybe because it seemed so close to home. It was even written by a fellow Canadian, author Kerry Clare, who also teaches blogging (I didn’t even know that was a thing) at the University of Toronto. I feel like we must be separated by a few degrees of connection at most. And yet, I was quickly hooked by both the premise of the story and Clare’s style. I’ve long been fascinated by the questions at the heart of this book. How much do you affect the story by telling it, and how many versions of the truth can there be? Much of the book riffs on themes of identity – who we think we are versus who others think we are, and about the persona we create online and how much it parallels or diverges from who we really are. Mitzi Bytes, the pseudonymous blogger, achieves enough fame to be named one of Time Magazine’s top bloggers, and writes three books, two of which become best sellers. The blogger behind the keyboard, Sarah Lundy, profits financially and eventually pays a painful toll, but she is divorced from the fame of her alter ego. What does fame mean, though, if it’s fame by proxy? And there’s a wryly self-effacing undertone which resonated with me, of being “internet famous”. She said, “What’s the point of a blog?” She’d been thinking about this a lot. It’s a question she’d been asking for years. “I wrote it for me, to figure out what I think of things. It was like therapy at first, and I guess I could have written it all down in a notebook and then shut it away in a drawer, but it wouldn’t have done any good for me, then.” The good wasn’t just finding her voice but actually using it, being heard. She was at the lowest she’d ever been, having lost everything she’d thought she had, but all of a sudden, she had stories to tell, and she was funny. That was huge. It wasn’t that the blog mattered simply because people read it, but when people read it, the blog mattered more. It was looking outward – a letter, not a diary. Though she would have written it even if nobody was reading, but because people were, she forged connections with them, was challenged by their feedback, pushed herself to be sharper, funnier. She’d tapped into a whole other world of friends and readers, and she could be honest there, when she couldn’t be at home. In writing this, I realized another reason that I might have had difficulty embracing Sarah Lundy and her online alter ego, Mitzi Bytes: I’ve never really followed the most popular blogs. From Dooce to Suburban Bliss to The Bloggess, I have always been able to appreciate their talent but never felt able to connect with them on that personal level that invests you in a blogger and their stories. And of course, the halcyon days of blogging as an act of community are long gone. And yet, here I still am – and I think a few of you are still listening. I think that’s why I also found the simple existence of this book intriguing: a book with a blogger as the protagonist released in 2017? How delightfully anachronistic. And yet, the story feels surprisingly current and relevant today. In the end, I enjoyed Mitzi Bytes, and I’d especially recommend it for anyone who has spent time thinking about blogging and identity, about the selves we present to others (online and offline) and the selves rattling around in our heads. If you’ve ever sent a blog post out into the ether and felt that thrill of connection and engagement, you’ll find resonance in this book. 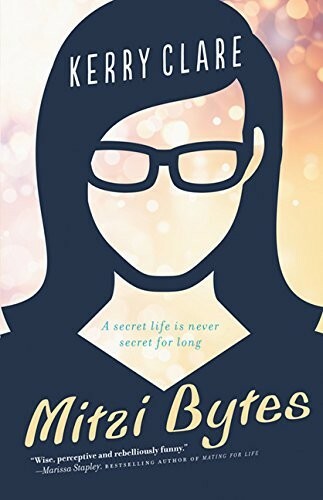 But even if you have not, Mitzi Bytes is still an interesting story, well told. I have been thinking about reading lately. At the end of last month, Goodreads kindly wrapped up all the books I read in 2016 (I’m fairly diligent about recording them) and told me I’d read a whopping 15 books during the year. That includes the five novels I read out loud to Tristan and Simon (Ready Player One, Neverwhere, Harry Potter and the Cursed Child, Wintersmith, and The Graveyard Book) but not the dozen or so Puppy Palace books I read to Lucas. 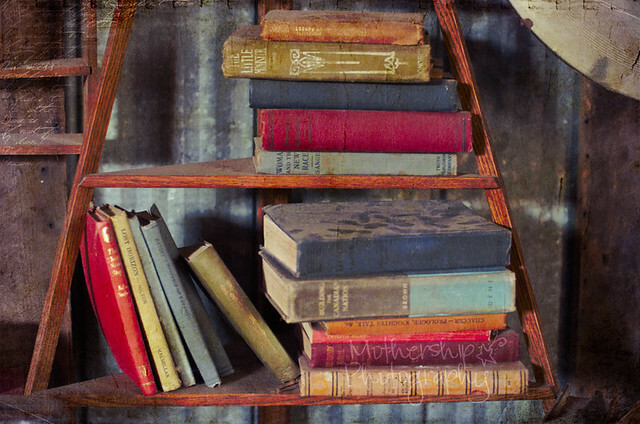 It seems like a pretty measly stack for a girl who loves to read. In my defense, a good portion of the year was dedicated to American Gods, Neil Gaiman’s not-insubstantial 635-page epic. And yes, it was the year that I fell totally and utterly in love with Neil Gaiman. All that to say, I’ve decided that I need to spend more time reading actual books and not just random Internet articles from Apartment Therapy and Medium and Slate to feed my soul. Yesterday on the CBC Radio program The Current, they had a piece on life-altering books. Author Will Schwalbe discussed 26 books that changed his life, and I loved that his list is eclectic and wide-ranging and does not take itself too seriously. It got me to thinking about books that have changed my life. I’m not sure I have the attention span for 26, but here are five that have been meaningful to me. In the interview, Schwalbe talks about books that find you when you need them. This is 100% what this book was for me. I was 23 years old and stuck in a rut dug of a series of catastrophically bad choices. Reading Generation X tweaked something in my soul that made me ask, “This is it? For the rest of my life?” and then, after I’d chewed that concept over for a while, “Hell, no!” It changed literally everything for me: within the year, I was divorced, on my own, and heading down a new path that led me to where I am today. I think this is the next book I’ll read out loud to the boys, although I’ve been afraid to revisit it lest it somehow tarnish my reverence for it. I was probably nine, maybe 10 years old when I picked up my mom’s copy of Firestarter off the sofa where she had been reading it and started flipping through it. I think I was first engaged by the fact that Charlie, the protagonist, was a girl of about my age. It’s not even in the top 10 of my favourite Stephen King books, but it was the first, and it gave me a taste for speculative fiction that persists to this day. After reading an Alice Munro short story in an anthology for high school English, I sought out more of her work. This one has stayed with me, though I’ve read so many of her books over the years. It was nothing short of shocking to me to find an oeuvre of work about growing up female in small-town Ontario when I WAS growing up female in a small-town Ontario. But I came to love her work for so much more than just the familiar descriptions of the verdant fields and sleepy towns surrounding London and beyond. Her characters are quirky and thoughtful, leading ordinary lives that occasionally break open to reveal the extraordinariness woven into the fabric of all of us, just below the surface. It was through Alice Munro that I learned to be open to and observe and love the beauty in minutaie. Because Harry Potter. I can’t think of any book I’ve re-read as many times as I’ve read the various books in the Harry Potter series. I started reading them when I was pregnant with Tristan, and the books feel like the literary backdrop to the last 15 years of my life, woven into everything about who I am and what I’ve been doing with my life for the last decade and a half. Another gateway book for me. When I read this funny, quirky, magical book in 2015, I wondered how I could have possibly missed reading such a delightful book for so long. Although I’d read one Gaiman book before, it sealed my love for him and introduced me to the delightful universe that is Terry Pratchett’s Discworld. Considering nine of the 15 books I read in 2016 were authored by either Gaiman or Pratchett, the significance of Good Omens on my reading habits cannot be understated. For more than 30 years, if you asked me my favourite author, I’d quote my holy trinity of Stephen King, Douglas Coupland and Alice Munro. Where there were three, now there are five. I tried very hard to not think too deeply about this list, and to come up with my top-of-mind impressions of books that have been meaningful to me for one reason or another. But thinking about them has only redoubled my desire to feed the beast with MOAR BOOKS for 2017. So, what are your top-of-mind top five books that changed your life? I am ready for our summer trip to PEI. I’ve got my packing list, my annotated maps and guides, my camera gear and sunscreen. What else do you really need for an awesome, epic beach vacation? Reading material, of course! My dilemma is a wealth of riches. I’m at a literary crossroads, and want to make sure I pick the very best beachy book to bring with me. Down one road lies Neil Gaiman’s American Gods. I’d read a bit of Neil Gaiman last summer and quite liked his style, but really fell head over heels earlier this year when I read Good Omens: The Nice and Accurate Prophecies of Agnes Nutter, Witch. That book rocked me back on my heels: how had I missed it before now? And then, and THEN, I stumbled onto Neil Gaiman’s beautiful Stardust, an absolutely exquisite fable that entranced Tristan and Simon and me in equal measures as we read it aloud. How I missed a rollicking fantasy on par with the Princess Bride with a hero named Tristran shall remain forever a mystery. And even more delightful, we found the movie to be as fully exquisite as the book – that never happens! Shall I continue to follow the adventures of Rincewind, Twoflower and the Luggage and move on to Sourcery, which is actually the fifth book in the Discworld series, or move chronologically to Discworld #3, Equal Rites? Oh happy dilemma, to know that it will take me years yet to work my way through 39 more books in the Discworld series, with the last and posthumous book pending publication later this year. There is nothing more exquisite than discovering a literary treasure trove, especially one that will keep you reading for years yet to come – especially without having to wait for that pesky intermission between publication dates. What books or series have lit you up with the excitement of discovery? Have you read any Neil Gaiman or Terry Pratchett, and which were your favourites? 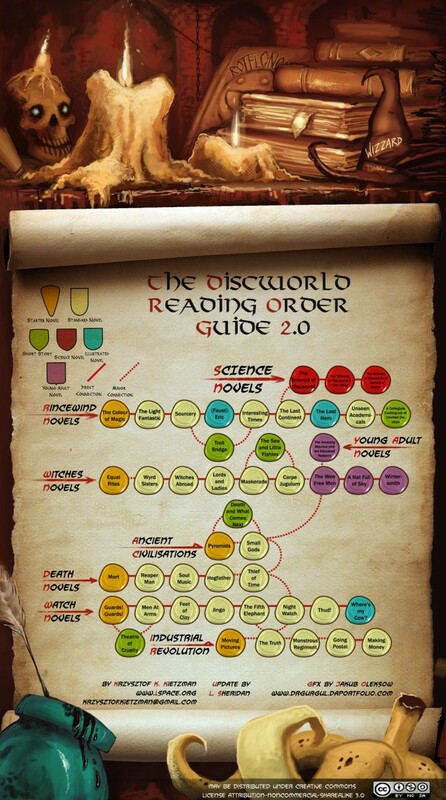 If you’ve read the whole of the Discworld series, how would you recommend they be read? 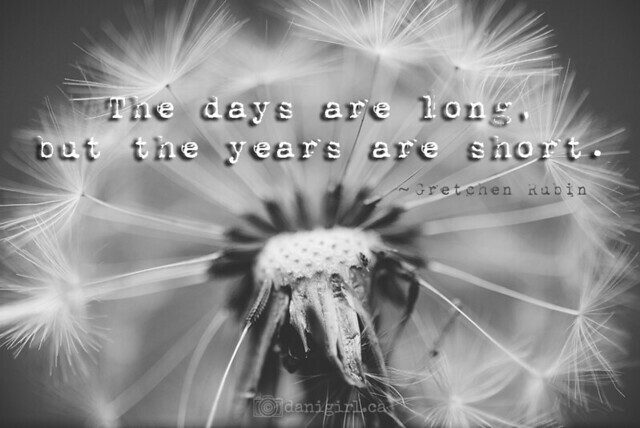 Photo of the day: The days are long, but the years are short. The Happiness Project has been on my “to read” list forever. I love the concept – you make your own happy, something I truly believe. Have you read it? What did you think? And don’t you find with every passing year that those years seem shorter and shorter? I really need to stop accepting books for review, because when I don’t love them I feel horribly conflicted. They gave me a free book, I should give it a nice review! But when it’s a struggle to find nice things to say, I find myself in an awkward position. Watching children play and invent whimsical games of fantasy is one of life’s great joys. But what if you could actually see your child’s imagination as it unfolded? And what would you do if your child’s imagination suddenly became dark and threatening? Living next door is Jamie Presswood, Anna’s childhood friend who’s grown much more handsome and hardened than the boy she once knew. But past regrets and their messy lives are making the rekindling of their complex friendship prove easier said than done. Between imaginary creatures stalking her son and a tumultuous relationship with David’s biological father, Anna may find it impossible to have room in her life or her heart for another man. But as David’s visions become more threatening, Anna must learn to differentiate between which dangers are real and which are imagined, and whom she can truly trust. Sounds fun, right? 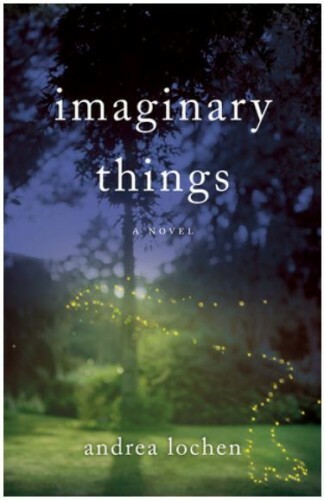 Mothering, magic realism, maybe a little love story on the side – sounds like a great formula for a light summer read. It had great potential, but I just could not warm up to this one. To the author’s credit, I was intrigued enough by David’s experiences with the dinosaurs that I kept reading all the way through to the end to find out how it all turned out. It was, however, a bit of a chore to endure the protagonist throughout the story. Young, self-centred and vapid, I was surprised to find myself actively disliking her, and found it nearly impossible to relate to her or her choices. When she called her son “whiny” instead of describing him as “whining” I may have actually cringed. I get that she’s supposed to be a young mother and clearly from a different generation than me, but even as a mother to a seven year old with an incredibly active imagination, I just couldn’t find anything in Anna to like. In fact, none of the characters resonated with me, not Anna’s kindly grandparents nor the imaginative little boy at the centre of the story. Only the hunky boy next door who’s “grown much more handsome and hardened” seemed to have much depth at all, and that wasn’t nearly enough to carry the story. It’s a really neat, imaginative idea for a story, and the end was satisfying enough to make it worth the time to read, but any time I find myself actually rolling my eyes at the conventions in a story, I can’t help but give it a less-than-stellar review. Disclosure: I received a free copy of this book to review. It might be the last! Crowdsourcing: What books do I need to read in 2015?